President Donald Trump made headlines earlier this month when he signed a number of Bibles while visiting an Alabama community recovering from a series of deadly tornadoes, drawing theological and political criticism from some quarters as others wrote the story off as mostly media spin. 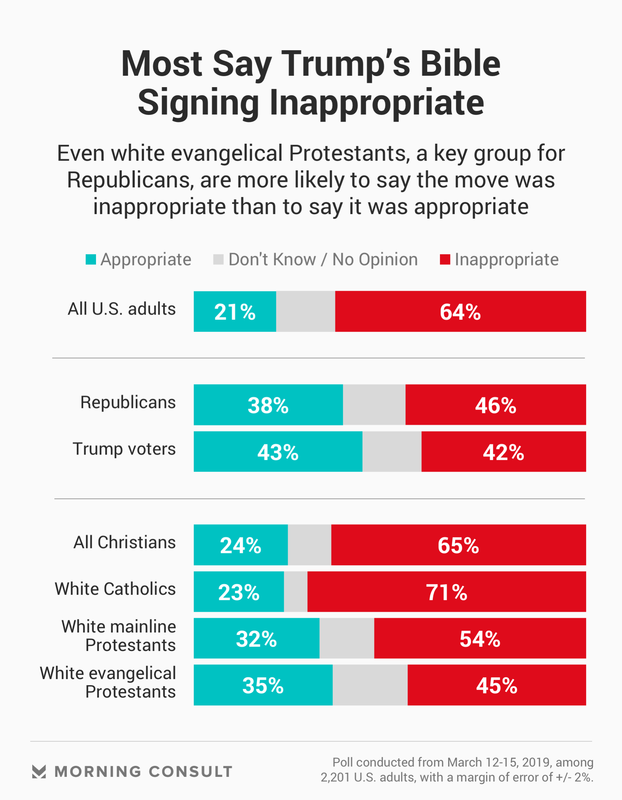 A new Morning Consult poll shows majorities of most Christian groups say the president’s actions were inappropriate, with even white evangelical Protestants — an important Republican voting bloc — more likely to say the move was inappropriate than appropriate. The gesture of signing Bibles is quite common and harmless on the surface, experts said; several presidents, including Ronald Reagan, signed Bibles. What makes the incident at Providence Baptist Church different is white evangelicals’ full embrace of “God and country,” according to John Fea, a professor at the Christian school Messiah College. He noted Trump serves as a balm for many Christian nationalists, who see their pews empty amid the country’s cultural and demographic shift. White evangelical Protestants shrank from 21 to 13 percent of the country between 2003 and 2017, per ABC News. The group stands out from other religious demographics on issues such as abortion and the U.S.-Mexico border wall. The largest “religious” group in the country is the religiously unaffiliated, at 25.3 percent in 2017. The president’s public signing “reads as the imprimatur of the emperor,” said Larycia Hawkins, an assistant professor at the University of Virginia’s department of politics and religious studies, further strengthening the symbolic relationship between the Republican Party and white evangelical Christianity. “It reads as a conflation of church and state in a country that is predicated on freedom for religion and freedom from religion,” she said. What makes this signing different from those by previous presidents, Hawkins said, is perceptions that the current president uses religion as divisive tool — citing his administration’s travel ban on a number of countries with predominantly Muslim populations — as opposed to a unifying one. Some of the media attention, experts suggested, can also be ascribed to the contrast between key parts of Christianity and elements of Trump’s personal life, such as his lewd comments on the leaked “Access Hollywood” tape and his alleged extramarital affair with adult film star Stormy Daniels. Trump saw his net approval dip 14 points among white evangelicals as the Stormy Daniels saga broke into the news cycle — but it rebounded within weeks. Indiscretions aside, Trump also bungled a Bible reference at Liberty University as a candidate in early 2016, citing a chapter as “Two Corinthians” rather than the more customary “Second Corinthians.” But it appears that for many of Trump’s evangelical supporters, his faith isn’t nearly as important as the sacrosanct values he has pledged to protect. Most (55 percent) of the public, including 54 percent of all Christians, said they think the president is not religious. White evangelical Protestants are roughly split within their group’s margin of error (47 percent say he’s religious, while 40 percent say he is not). Experts said neither Trump’s perceived lack of religiosity nor attitudes about the propriety of his decision to sign the Christian tome in Alabama, are likely to hurt him come 2020. White evangelical Protestants’ approval of Trump remains high at 72 percent, per Morning Consult polling. The March 12-15 survey was conducted among 2,201 U.S. adults with a margin of error of 2 percentage points. Correction: A previous version of this story misstated the share of the religiously affiliated in 2017.